This news item was posted in K, Kidney category and has 0 Comments so far. Kidney stones are hard deposits that are formed as a result of the crystallization of minerals and acid salts in urine. Since small kidney stones can be flushed out through the urinary tract, these are not a cause of serious concern, the large ones often give rise to distressing symptoms. The signs of kidney stones exhibited by the sufferer are similar, regardless of one’s age or gender. 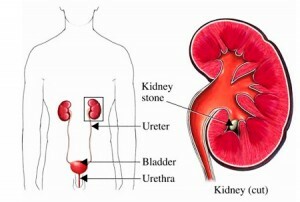 Anyone who has ever suffered from this medical condition knows how distressing and painful, kidney stone signs can be. Wondering what causes kidney stones? Here’s some information on the causes, symptoms, risk factors and treatment of kidney stones. Before I move on to the signs of kidney stones, let me tell you about the causes of kidney stones. Under normal circumstances, urine contains certain substances that inhibit the process of crystallization. If such inhibitors are not present in the required amounts, one is at an increased risk of developing kidney stones. When urine gets concentrated with calcium in combination with oxalate or phosphate, it gives rise to the formation of hard stone-like masses. At times, the presence of substances such as uric acid, cystine or struvite could also be responsible for the formation of kidney stones. Those who have a family history of kidney stones might also be prone to developing this medical condition. An imbalance in the components of urine could also be caused due to dehydration, poor dietary habits or use of certain drugs. Medical conditions such as renal tubular acidosis, gout, cystinuria, hypercalcuria and hyperoxaluria could also give rise to formation of kidney stones. Well, whatever be the cause, signs and symptoms of kidney stones can stress one out. A person experiencing kidney stone signs must seek medical help soon. Now that you have some idea about the common causes of kidney stones, let’s move on to the signs of kidney stones in men and women. Statistics reveal that the incidence of kidney stone in men is higher than that of women and children. The size of the kidney stone is the determining factor when it comes to the severity of kidney stone symptoms. The signs of kidney stones are experienced when the kidney stone gets stuck in the ureter. When the minerals crystallize into large hardened deposits, these can get lodged in the ureter and obstruct the flow of urine. Kidney stone pain, which is also referred to as renal colic, is one of the early signs of kidney stones. The pain might come in waves. Excruciating pain is experienced just below the ribs, towards the side or at the back. The pain might also radiate to the lower abdomen and groin area. Other signs of kidney stones in women, men or children include nausea, vomiting, cloudy urine, persistent urge to urinate, painful urination, blood in urine, burning sensation during urination, fever or chills. Bouts of incessant crying during urination is one of the common signs of kidney stones in children. Besides these distressing signs of kidney stones in children and adults, the presence of kidney stones also raises the possibility of kidney infections. Now that you know what are signs of kidney stones, let’s move on to kidney stones diagnosis and treatment. Besides a physical examination and analysis of the signs of kidney stones, doctors might conduct blood tests, urinalysis or an abdominal X-ray to diagnose the condition. Imaging tests such as helical CT scan, kidney ultrasound, abdominal MRI or pyelogram might also be conducted to help doctors formulate the diagnosis. Besides drugs for kidney stone pain relief, certain medicines might be prescribed for facilitating the passage of urine. If kidney stones don’t pass out rapidly, calcium channel blockers or alpha blockers might be recommended for kidney stones treatment. In case, the medicines don’t seem to be working, doctors might resort to lithotripsy, a procedure wherein shock waves are used for breaking down the kidney stone into smaller pieces. Once the stone breaks down into smaller pieces, the task of passing kidney stones is rendered much easier. Besides shock wave lithotripsy, other procedures such as nephrolithotripsy, ureteroscopy or open surgery might be recommended for the treatment of kidney stones. One could also try some natural remedies for kidney stones. Increasing one’s intake of water and following a kidney stones diet will also prove beneficial. This was all about signs of kidney stones. If you have been experiencing any of these symptoms, you must get yourself medically examined soon. As with any other medical condition, a timely treatment will certainly help in alleviating kidney stone signs and put you out of your misery. You must also make some lifestyle-related changes for the prevention of kidney stones in future.